Building a formal impact measurement program from scratch can seem daunting. An organization taking the leap to go beyond anecdotes to the formal quantification of social and environmental returns needs plenty of support. The newly-released IRIS (Impact Reporting and Investment Standards) Registry serves as a platform that gives organizations a useful reference for navigating the dizzying array of emerging impact metrics, and ways to present these metrics. The Registry can be accessed here. The IRIS registry is a platform created by the Global Impact Investing Network (GIIN), a not-for-profit organization, which since its founding in 2009 has been dedicated to increasing the scale and effectiveness of impact investing. The Registry functions as a directory that provides transparency into the IRIS metrics regularly in use by various organizations; it also allows users to browse organization profiles by the sector focus, impact goals, and target regions of the listing organization. The launch of the IRIS registry marks an important moment in the broader development of the impact sector. Not only will The Registry serve as a tool for those new to building formal impact measurement programs, but will also serve as a “formal step towards full transparency for impact reporting; this transparency is critical to increasing the credibility of performance measures, which ultimately helps increase investment into the sector,” says Genevieve Edens, Impact Assessment manager at the Aspen Network of Development Entrepreneurs (ANDE). 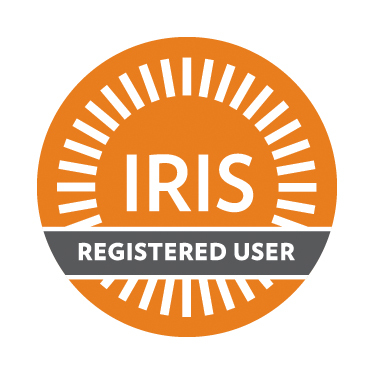 The GIIN team received significant demand from IRIS users for examples of how other organizations were applying IRIS metrics; The Registry essentially functions as a peer support group and ultimately helps drive IRIS adoption, “the beauty of IRIS is the promise of greater standardization in impact evaluation – which is precisely what The Registry accomplishes. For the first time, we will be able to understand exactly how a significant number of other investors track impact and use IRIS, and compare our own efforts to those of our peers. We are very excited about it,” says Ben Thornley, Director of InSight at Pacific Community Ventures. From the perspective of another sector-level organization like ANDE, being able to browse through a list of organizations (currently 34) that are using the IRIS metrics and dive into the details of their programs really brings the IRIS taxonomy to life, “rather than an abstract set of definitions, this lets us see how organizations are applying the metrics, and think through the choices that we’ve made for measuring performance,” Edens says. Beyond existing IRIS users, The Registry has also served as a useful point for organizations that are currently using impact measurement to some degree, but haven’t necessarily formally integrated IRIS metrics, “The Registry is effectively helping these organizations to move beyond the threshold,” says McCarthy. (Left: Organizations can use this IRIS badge to signify that they have officially adopted IRIS impact metrics). Another surprising finding so far is that, in addition to nascent metrics users, several advanced IRIS users are using the tool to learn from peer organizations, “in several of our conversations we heard from several more advanced users that they were interested in reviewing other listings, and a few times this actually provoked a reconsidering of a user’s framework or of the metrics they were previously using,” McCarthy says. Organizations like Sarona Asset Management have been relying on The Registry to help them learn how to more effectively communicate about impact metrics, “The IRIS Registry is another step towards articulating a common language for those in the impact investing universe. It provides like-minded organizations with an accessible platform to compare and share how they have tackled the process of impact reporting,” says Michael Ellul, a Business Analyst with Sarona Asset Management. The target IRIS user base has consisted of funds and managers, but the GIIN hopes that investors in funds and capacity builders doing intermediary work with new businesses will also register. The Registry also aims to be a key resource for academics and consultants who are looking at ways to apply impact metrics, and how these practices are changing over time (the evolution of the metrics themselves can be followed as new releases of the IRIS taxonomy are released). The GIIN also recognizes The Registry as an important tool to formally recognize the organizations using IRIS, and get a better handle on the scope of IRIS users, given that it is available as a voluntary, public resource, “we want to both formally acknowledge and also get a better sense of the number and spectrum of current IRIS users,” says McCarthy. 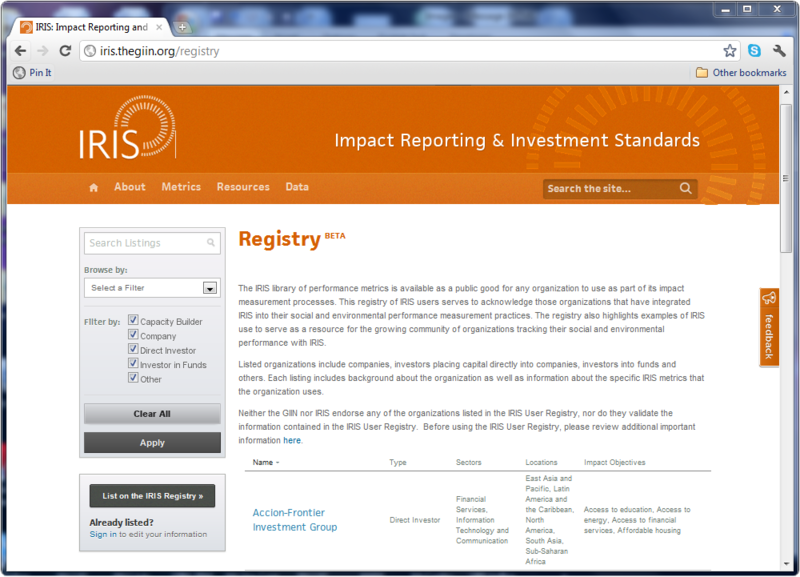 (This is a screenshot image of The IRIS Registry landing page. The Registry can be accessed at http://iris.thegiin.org/registry). The GIIN has ideas for the next iteration of The Registry; they envision, for instance, offering users the ability to more clearly demonstrate how they are grouping their metrics, such as by sector (i.e. agriculture) or by objective (i.e. access to energy). Right now, the platform enables organizations to list all their IRIS metrics, which are grouped on the Registry according to the IRIS structure, rather than in frameworks designed by the users, “we see two main benefits to showing user frameworks down the road – one is from a resource perspective, allowing new users to get a better sense of applied metrics frameworks, and the other is to allow users to think more strategically about how they are implementing their IRIS metrics,” McCarthy says. The Registry is only as strong as its user base, and The GIIN welcomes feedback from the NextBillion community about it. Do you think the IRIS Registry will help your impact measurement work? When are you most likely to reference the registry – in due diligence? Formalizing investment terms? To learn from your peers? Please comment below or send your feedback directly to Kelly McCarthy at Kmccarthy@thegiin.org. Note: Neither the GIIN nor IRIS endorse the organizations listed in the IRIS User Registry, nor do they validate the information contained in the IRIS User Registry. Before using the IRIS User Registry, please review additional important information here.